The following macro, SHOW, is used in the subsequent analyses to display cluster results. It invokes the FREQ procedure to crosstabulate clusters and species. 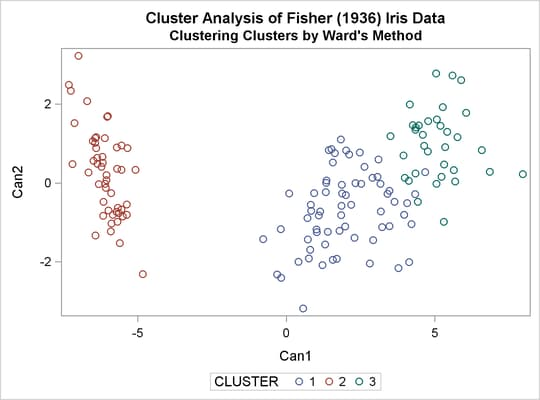 The CANDISC procedure computes canonical variables for discriminating among the clusters, and the first two canonical variables are plotted to show cluster membership. See Chapter 31: The CANDISC Procedure, for a canonical discriminant analysis of the iris species. 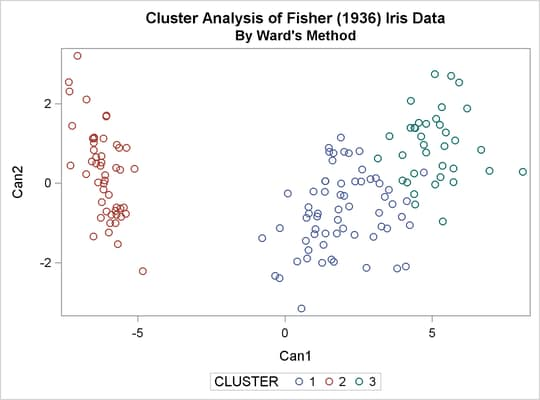 The first analysis clusters the iris data by using Ward’s method (see Output 33.3.1) and plots the CCC and pseudo F and statistics (see Output 33.3.2). 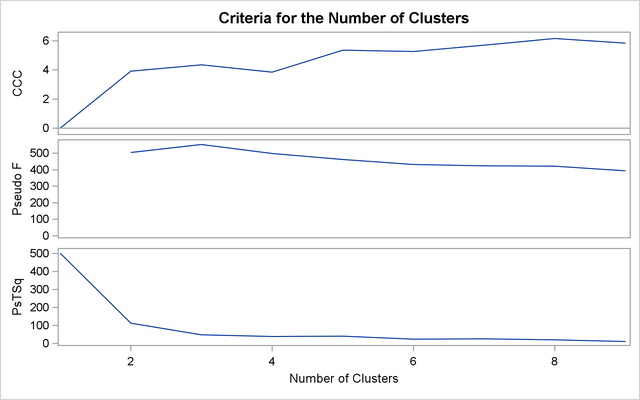 The CCC has a local peak at three clusters but a higher peak at five clusters. 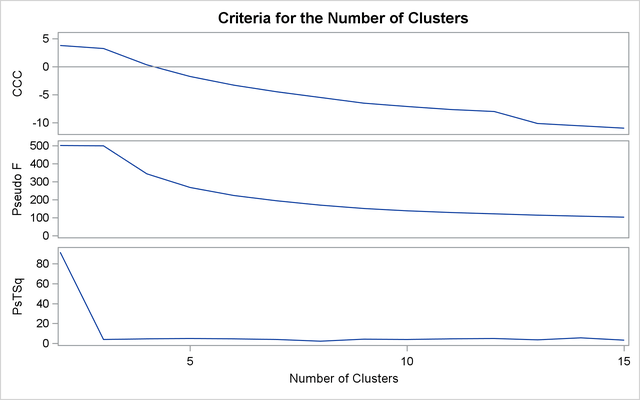 The pseudo F statistic indicates three clusters, while the pseudo statistic suggests three or six clusters. The TREE procedure creates an output data set containing the three-cluster partition for use by the SHOW macro. The FREQ procedure reveals 16 misclassifications. The results are shown in Output 33.3.3. 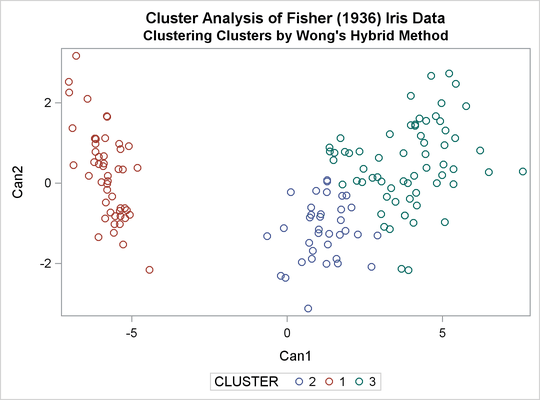 The following analysis uses K=8 to produce three clusters for comparison with other analyses. There are only six misclassifications. The results are shown in Output 33.3.5 and Output 33.3.6. 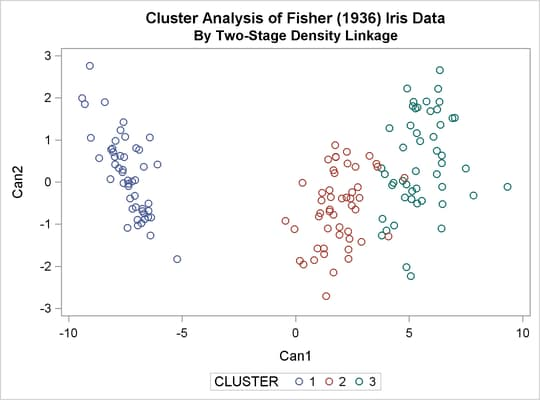 The following SAS code uses the iris data to illustrate the process of clustering clusters. 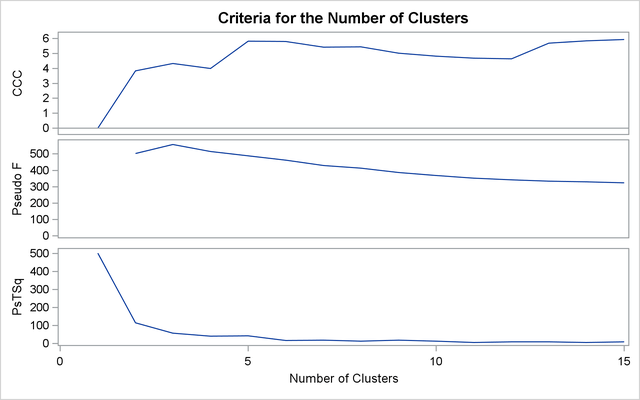 In the preliminary analysis, PROC FASTCLUS produces ten clusters, which are then crosstabulated with species. The data set containing the preliminary clusters is sorted in preparation for later merges. The results are shown in Output 33.3.9 and Output 33.3.10. The following statements produce Output 33.3.11 through Output 33.3.14. The following statements produce Output 33.3.15 through Output 33.3.17.